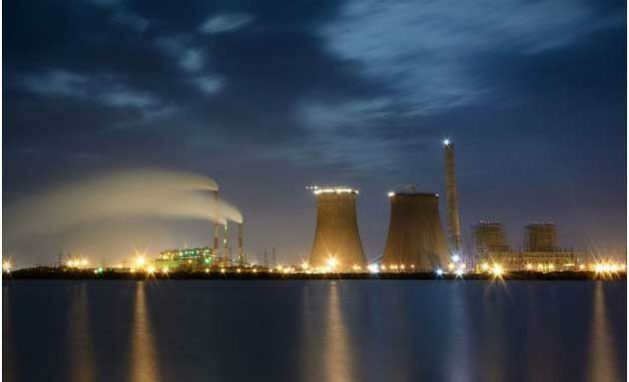 Tuticorin thermal power station. Credit: Begoon/Wikimedia Commons Water shortages are hurting India’s ability to produce power. WASHINGTON DC, Jan 17 2018 (IPS) - New WRI research finds that 40 percent of the country’s thermal power plants are located in areas facing high water stress, a problem since these plants use water for cooling. 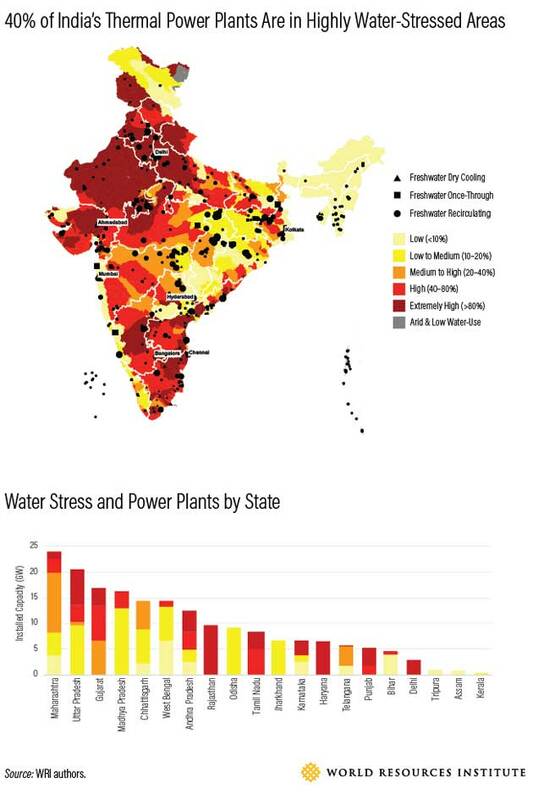 Scarce water is already hampering electricity generation in these regions—14 of India’s 20 largest thermal utilities experienced at least one shutdown due to water shortages between 2013-2016, costing the companies $1.4 billion. What’s the Difference Between Water Withdrawal and Consumption? •	Water withdrawal: The total amount of water that is diverted from a water source (e.g. surface water, groundwater) for use. •	Water consumption: The portion of water that is not returned to the original source after being withdrawn. Much of the water withdrawn by plants is returned to the lakes and ponds from which it came, but a lot is also consumed, and not returned to its original source. 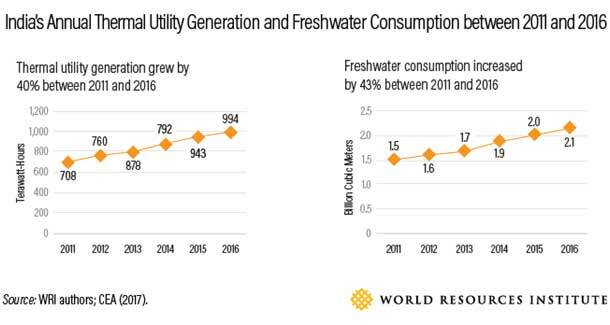 We found that almost 90 percent of India’s thermal power generation depends on freshwater for cooling, and the industry is only growing thirstier. More than a third of India’s freshwater-dependent plants are located in areas of high or extremely high water stress. These plants have, on average, a 21 percent lower utilization rate than their counterparts located in low or medium water-stress regions—lack of water simply prevents them from running at full capacity. Even when controlling the comparison analysis by unit age, fuel type and plant capacity, the observation was always the same: Plants in low- and medium-stress areas are more able to realize their power output potential than those in high water-stress areas. There are practical and financial implications of power plants’ thirst. 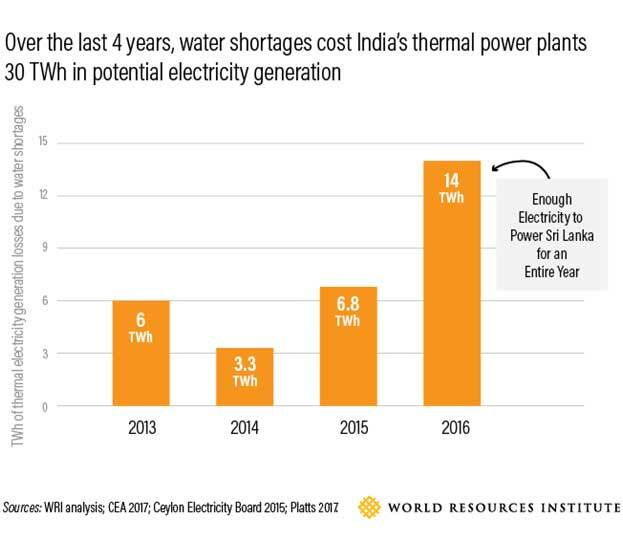 Between 2013 and 2016, India’s thermal plants failed to meet their daily electricity generation targets 61 percent of the time due to forced power plant outages. The reasons ranged from equipment failure to fuel shortages. Water shortages were the fifth-largest reason for all forced outages—the largest environmental reason.